Hello guys, here is a recipe for Punjabi style eggless tawa Kulcha (Indian flatbread) which my mom often makes when all our family gets together during the holidays. She makes a big batch of dough which lasts easily 3-5 days in the refrigerator and Kulchas can also be cooked (in advance) if expecting company and stored in the fridge for upto 5 days..although nothing beats fresh homemade Kulcha with a bowl of tasty curry. 6 cup flour ( we use combination of 4 cups whole wheat flour and 2 cups of all purpose flour). – Begin by pouring flours into a bowl. – Gradually add more water as required to make smooth dough. Let dough stand for 4 hours (covered with a wet – (not dripping with water though) kitchen cloth). Place it in a warm place like instead oven or above fridge or one of the kitchen cupboards. – After 4 hours, take small golf size dough balls, roll them out with rolling pin (using little bit of flour) and cook on a hot griddle/skillet until light brown spots appear on both sides. At first glance Kapil Sharma seems like your average Indian boy from next door but this simple Punjabi boy from town of Amritsar has won hearts of millions of Indians from all over the world with his comedy. It won’t be wrong to say that ‘Kapil sharma’ is a world class standup comedian who knows what tickles and makes Indian crowds laugh. And like all Punjabi’s Kapil Sharma’s love affair with food is old and solid. He is very fond of Rajma chawal and his favourite dish is Aloo Parantha. Kapil often refers to food and jokes about not having enough food to eat at his home in his show ‘Comedy Nights with Kapil’ on Colors TV. Recently he made a comment inorder to encourage Indian people to go out and vote: If you just eat pakodas/pakoras on April 10 (polling day), be ready to get stomach ache for next five years. Don’t just eat Pakodas but go out and vote. If he sees a fat person in his show, he makes fun of them by saying ‘Did you eat lot of Chole Bhature Today?’ and the audience loves his guts and teasing manner. With two episodes of his stand-up comedy show per week and an impending feature film debut looming over his head, comic entertainer Kapil Sharma is currently going through the most hectic time of his life. And now he has a nutritionist accompanying him to all his shootings as he needs to lose weight (chickpea salad recipe to lose weight) for his movie project. Fortunately, Kapil’s back problem has been taken care of. “I’ve been regularly working out and doing back exercises. So the back problem has gone. But nowadays I have a shoulder pain,” he said, adding that he is fighting a desperate battle with his schedules. “I need to create a bank of episodes for my show before I start shooting for my film from May 15. I can’t run back-and-forth from the film set to the shooting of the show. They’re two completely different disciplines, and I can’t allow them to clash. “Stand-up comedy comes as naturally to me as breathing. But film acting is an entirely new experience for me. 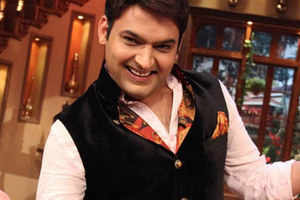 I’ve to give it my hundred percent,” said the comedian, who is set to make his film debut with a Yash Raj Films project. “The channel says the TRPs will suffer if we cut down the episodes. Luckily, for me I got an unexpected reprieve when the first schedule of my film Bank Chor was shifted from April to May. I am racing against time to create a bank of episodes, so I can complete one schedule of Bank Chor without any interruption,” he said. All his fans are looking forward to his first movie debut ‘Bank Chor.’ All the best to our favourite Kapil Sharma. Hope he gets in better shape and reaches his fitness goals while still enjoying his favourite Indian foods. Kapil, you have managed to put a smile on our faces and hope that you will continue to do so in the future. Meetha Paratha is a sweet Indian flatbread stuffed with cashews, blanched almonds, pecans, raisins etc (basically any dry fruit of your choice.) It is one of my favourite flatbreads especially because so many of my childhood memories are associated with it. As a kid, sometimes when I would be upset my mom prepared this tasty paratha for me because she knew I loved it. Now, I make it for my little ones and they enjoy it too. Take a small portion of dough and divide it into two equal parts. Roll it out as thin as you can and then add on dryfruit onto one part. Sprinkle sugar. Cover with the other part and seal the edges by pressing on with your finger tips. Cook on a hot griddle/ pan until brown spots appear on both sides. As you are cooking, you can add on ghee/butter. Enjoy as a snack or for breakfast. How to make Chocolate Paratha? Chocolate spread- Nutella works great. I often use hazelnut spread. Roll it out as thin as you can and then add on chocolate spread. Fold it and roll it out again with help of a little bit of dry flour. Cook on a hot griddle/ pan until brown spots appear on both sides. As you are cooking, you can add on ghee/butter. Enjoy as a snack or for breakfast. One of the easiest desserts ever is bread pudding. Here’s how you can make it with an indian touch. 3-4 drops of Kewra essence (1/4 tsp). If you don’t have it use good ol’ Vanilla extract. Grease a standard 5×9″ loaf pan with oil and place bread slices in it. I divide each slice into 4 equal parts but you can make them smaller as well. Add Dry fruit onto bread slices. Bake at 350 F for 40-45 mins until nicely set. You can prepare a special bread pudding sauce like caramel or vanilla sauce, serve it with ice cream or drizzle maple syrup/ may be even honey and serve. St. Patrick’s Day Special – How to make Shamrock Flatbread? St. Patrick’s day food might be associated with being greasy and unhealthy, this is one recipe that you can enjoy guilt free. Pair it with Masala Hummus and everyone at that St. Patrick’s day you are invited to will be wowed or simply prepare it to share with your co-workers or to get into St. Paddy’s day spirit. Ingredients: Bunch of Spinach leaves and 2 cups whole wheat flour. Method: Make spinach puree by blending spinach leaves with 1 cup of water. Add 1 to 1.25 cups of puree into 2 cups flour and make a dough. You can add 1 tbsp oil to the dough to keep it soft and moist. Let rest 10-15 mins. When ready to proceed, heat a pan/tawa/griddle. Flaten out small portion of dough (Golf Ball size) and you can either use a cookie cutter in Shamrock shape or cloverleaf shape to cut the dough out. Cook the shape on the pan until brown spots appear on both sides. Alternatively flatten out the dough, cook it until both sides have brown spots (2-3 mins) and then cut out cloverleaf shapes and serve with chutney of choice or Masala Hummus. Enjoy! Wishing you all lots of good luck this St. Patrick’s Day. Have a wonderful St. Patrick’s Day 2014. Indian flatbread stuffed with lentils, sugar and coconut mixture is called Puran Poli. It’s really tasty and can be enjoyed anytime during the day. In India, it is specially made during the Holi season. My kids love it and I am sure yours will too. Wishing you all a very Happy Holi 2014 from our family to yours.